Only 3 miles from Yeovil Town Centre. Charming farm house accomodation set in 120 acres of farm land. 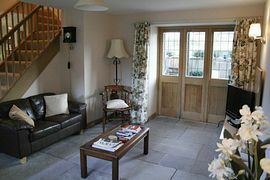 Celia and Henry are pleased to welcome you to Home Farm, a charming recently converted barn offering bed and breakfast accommodation in Chilthorne Domer, near Yeovil. The farm is set in 120 acres of farm land, just 3 miles from Yeovil town centre. It offers a prime location for tourists and business people alike. 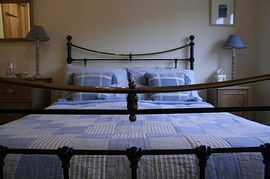 Our bed and breakfast accommodation comprises of 2/3 double bedrooms all with ensuite. Toiletries are provided and each bedroom has bathrobes and hairdryers. Wireless Internet is available for use of lap top computers. Breakfast is served in the kitchen/dining room. A guest lounge for reading or to watch television. A selection of DVDs are available. 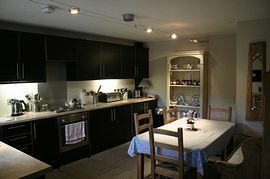 The kitchen is available for guests to use, with a microwave and other appliances. 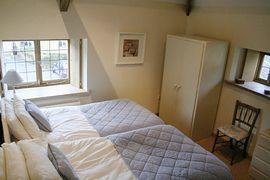 Single Occupancy: £40.00 per room per night. 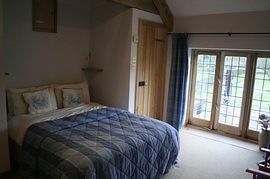 Double Occupancy: £80.00 per room per night. Take A37 Bristol / Ilchester Road for 2 1/2 miles to Halfway Pub, then turn left (Chilthorne) then immediately right. Continue through the village for less than 1/2 mile to Home Farm on the right (opposite Forts Orchard).